establish communication from Tipperary via Cave Link device. A 3 man team was to make the journey to the far camp (beyond S3) supported by the other divers. 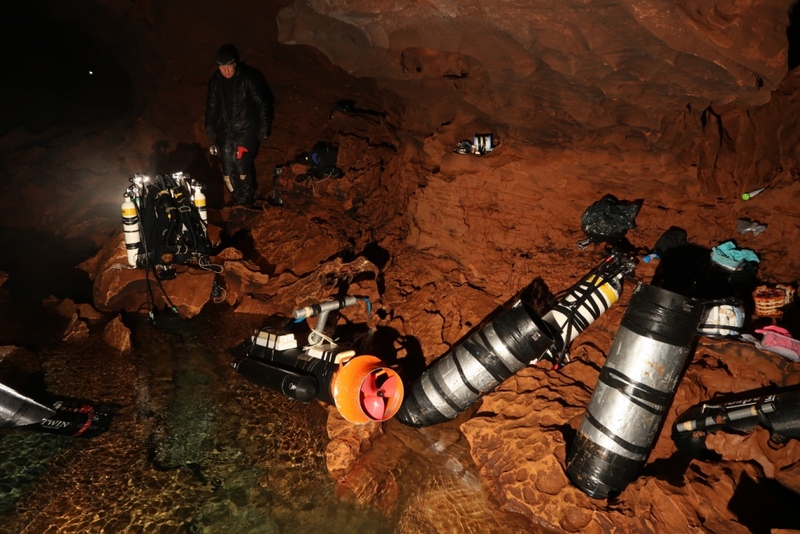 In the event only 2 divers managed to reach the far camp and only 1 of those made it to Sump 6 and explored further. The initial days of the expedition comprised of transporting large quantities of dive kit to Sump 2 dive base at 1km from the entrance. This included the large scooters which would propel the exploration divers through Sump 2, these weigh around 80 kg out of the water and a 4 man team is required to transport them up the sharp and awkward passage between Sump1 and Sump 2. Habitats were also to be prepared in Sump 2 to allow divers to decompress in comfort. Once the necessary kit was in place at Sump 2, stage dives where undertaken up to 2000 m into Sump2, where stage cylinders and scooters were placed for bail-out scenarios. Another stage dive was then necessary to transport camping kit to Tipperary for an interim stage camp. This was only achieved by 1 of the team and this diver established a camp and spent 1 night in Tipperary before exiting. The dive to Tipperary is 5160 m long and requires around 3 hours of decompression before surfacing either side due to the deep sections (70 m) of underwater passage. A scooter failed at the start of an attempted dive to Tipperary, and the fault turned out to be an electronic control unit. A new part from Germany was ordered and this took several days to arrive. Once this interim camp (Tipperary) had been established, several days of preparation, re-charging of batteries was necessary to allow for the next stage of the expedition which was for the 3 man team to travel to Tipperary, spend 1 night there and then proceed through Sump 3 and establish the far camp. This is from where all the further work would be based. Due to substantial amounts of equipment that needed to be towed through Sump 2 only 2 divers managed to reach Tipperary, the 3rd diver retired at about 1200 m into S2 with serious drag issues. 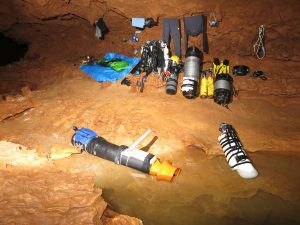 The only issue was that the Cave Link device did not reach Tipperary and so no communication was possible for the entire 6 days, whilst the 2 divers continued to the end of the system. Both of the continuing, exploration divers passed Sump 3 the following day, taking extensive video footage of Sump 3 on the way. Despite much advice, being sought and given, 1 of the exploration divers did not take a wetsuit for the caving/diving beyond Sump 3. This had proved to be the best and safest option for the previous 2 expeditions. Therefore it was inevitable that this diver tore a large hole in his drysuit on the first day beyond S3 (as did the 2nd diver although smaller tear) and this precluded him taking any part in the work beyond S5. In addition, using a drysuit caused the diver to overheat and so became drenched with sweat within the drysuit and saturated the underclothes. The repair of the drysuit was difficult, but luckily this achieved to make a drier exit possible later in the week. With help only as far as Sump 5, the remaining push diver found transport and progress difficult and was only able to manage one dive in Sump 6. 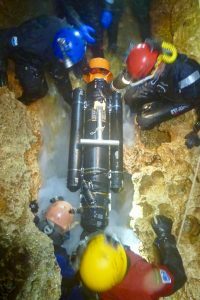 The limit of 2015 (60 m into the sump 6, at 8 m depth) was passed and beyond this the passage dimensions increased, as did the depth ( – 40 m) at which point the buoyancy device of the diver failed (due to inflator hose breaking off) and so a negatively buoyant diver was forced to crawl back to base, having only progressed 140 m beyond the 2015 limit. No survey work was carried out at any point during the 6 days. Some of the dry passages between S5 and S6 were also explored the same day as the push in S6. The remaining time was spent transporting equipment between sumps, packing up the far camp, returning to Tipperary and exiting the cave. Thus ended the expedition. Although a small amount of further exploration took place, little other work was achieved. The depth of S6 now would suggest that a full back-mounted rebreather be taken there to make meaningful progress. The survey work remains outstanding and so a further expedition will be planned for 2019. This gain would involve a 7 day camp, beyond S3.